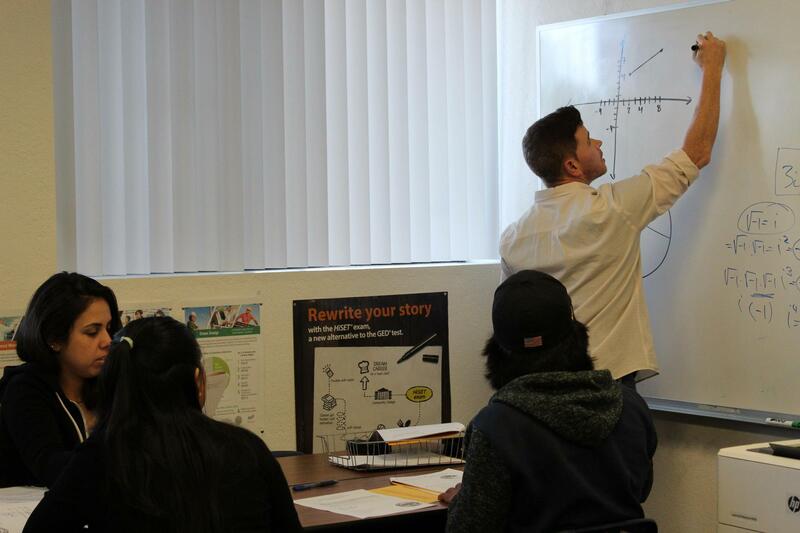 Students interested in our high school diploma program or who wish to prepare for the High school equivalency certificate must first attend an orientation that is held every Monday the school is in session, at 1:00 PM or 6:00 PM and lasts from two to three hours. For students who wish to complete their high school diploma, the school offers a WASC approved 190 credit diploma program. A member of the counseling department will review your transcript and determine which classes you need to complete your diploma. Students can attend our learning lab at any of these class times: 8:30 AM — 12:30 PM, 1:00 PM — 3:00 PM, 3:00 PM — 5:30 PM, or 6:00 PM — 9:00 PM. For students who are more than 40 credits short of diploma requirements, or who simply need a qualification in a comparatively short period of time for a job, entry into some other program, or to qualify for financial aid at a community college, earning the high school equivalency certificate issued by the state of California through taking the HiSET tests may be the best option. The school's Pearson Vue testing lab is an official testing site for the GED, HiSET, and many other tests. These tests must be taken at an official testing center. They cannot be taken at home as some Internet sites suggest!